Resource management is an important activity in project management. Generally project managers need resource performance reports for the actual works in order to understand the real performance of their projects. They make a comparison between the planned, earned and actual quantities in order to make a decision reagarding to their project’s productivity. There are several softwares available in the market for this purpose and Primavera P6 is one of them. 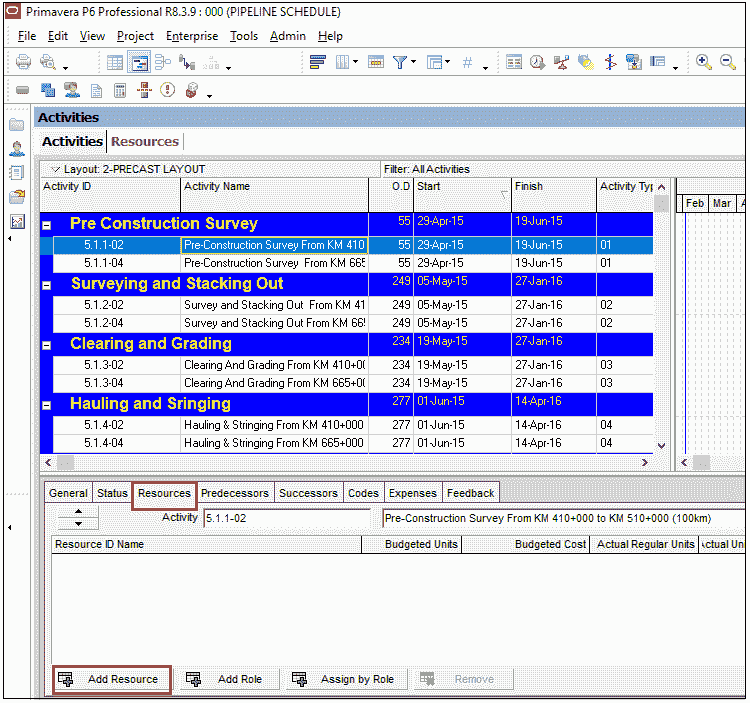 Primavera P6 resources feature enables to assign material, labor and equipment resources and costs to your schedule. Resource allocation, and, possible over-allocation of labor resources can be tracked by the reports of P6. This article demonstrates the assigning of labor resources to activities in order to calculate the total labor cost of the project. Resources include the labor and equipment that are used to perform activities within a project. Resources are time based and they are often used between activities. Creating a resource pool may be useful to define the organization’s resource structure and supports the allocation of resources to the relevant activities. 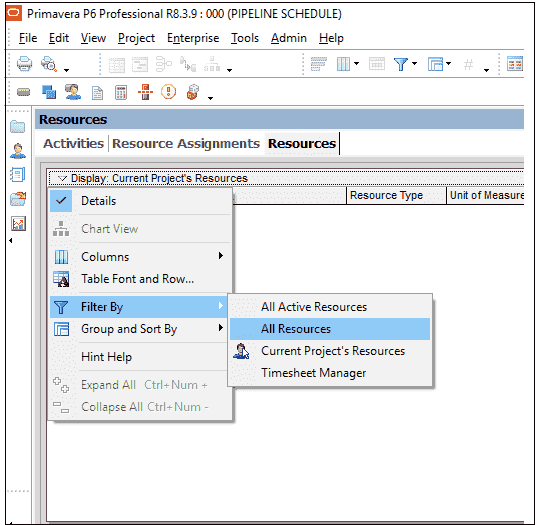 If you want to make resource plannig in Primavera P6, you can easily create and assign resources to activities with the help of Resources tool of P6. This tool will help you to list and organize all the project resources by their type. It is possible to create and assign labor, material and equipment resources in Primavera P6. Allocation and distribution of resource quantities can be seen from the “Resource Assignments” window. You can also define a resource’s roles, calendar, contact information and time-varying prices if needed. For better understanding, let’s review a sample work schedule. We have a sample pipeline project and the activities are grouped as per “Activity Types” such as Pre-Construction Survey, Survey and Stacking Out, Clearing And Grading, Hauling & Stringing, Bending and Welding as seen in the figure below. We will define labor resources and assign them to the activities. In order to define a resource, select Enterprise | Resources from the main drop down menu at the top of the screen. If the “Resources” window is empty, select Display | Filter By: All Resources as shown in the Figure 2. We will define one labor resource for each task instead of assigning specific people. Select Edit | + Add and type the Resource ID and the Resource Name. Pre-Construction Survey is the first labor resource in our project. It represents all the workforce needed to perform the Pre-Construction Survey activitiy, Figure 3. In this example, we will not insert a unit price for the resource because we will insert a total budgeted quantity and cost the resource. 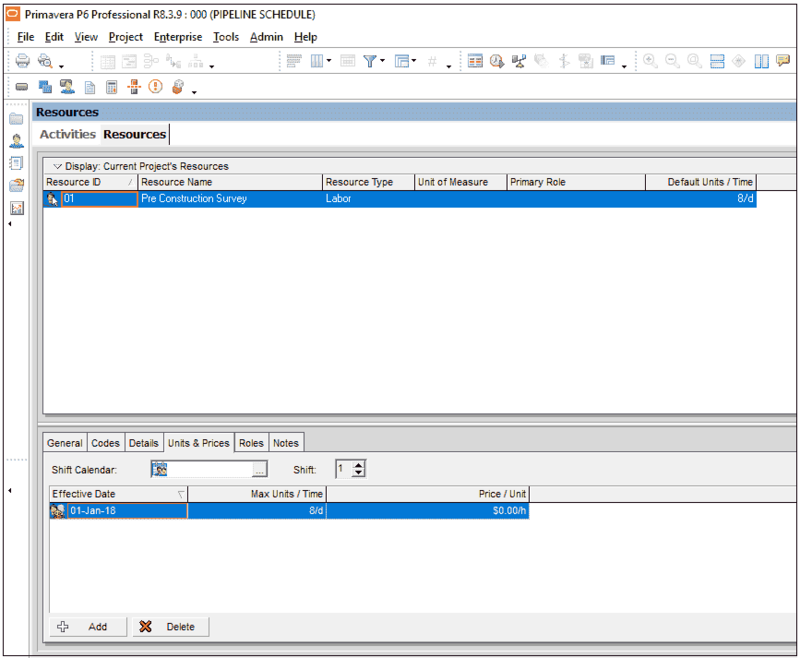 How to Assign Resources to Activities in Primavera P6 ? In order to assign a resource to an activitiy, we will open the activity details by selecting View | Show on Bottom| Details from the main drop down menu at the top of the screen. We will assign resources by using the Add Resource button at the bottom left hand of the screen, Figure 5. After assigning the “Pre Construction Survey” resource to the “Pre Construction Survey” activity, we will insert “Budgeted Units” and “Budgeted Cost” for the activity. Let’ s assume that the “Pre-Construction Survey” activity will be performed with 5500 mahnours and the total cost of this activity is $60.000, Figure 6. Make sure that the activity type is “Task Dependent” and the duration type is “Fixed Duration & Units. Check them from the “General” button at the bottom left hand of the screen, Figure 7. Duration is fixed because we have determined the activity duration, that we do not want to change it depending on the resource quantity. We fixed the quantitiy because we have a total budgeted quantitiy for this activity. It will not change as the duration changes. The next step is to analyze the “Resource Usage Profile” after assigning resources to the activities and inserting budgeted cost and budgeted units. We will select View | Show on Bottom | Resource Usage Profile from the main drop down menu at the top of the screen. We can see the budgeted units and and costs from the “Resource Usage Profile” , Figure 8. You can assign several resources to activities in P6 to track the resource and cost performance of your project. 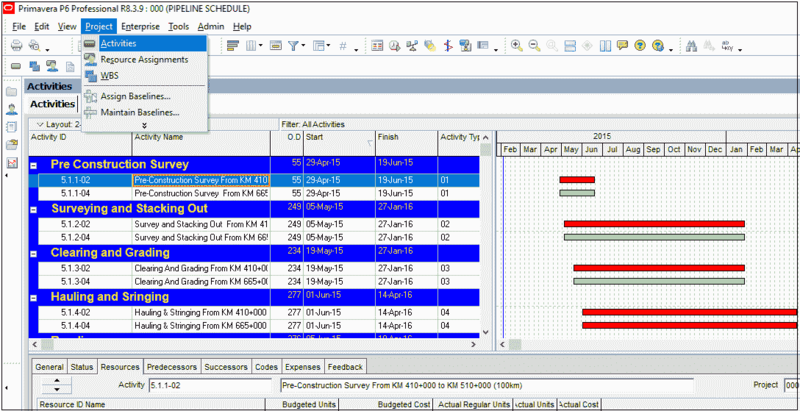 Primavera P6 resources feature is a flexible tool for performing resource analysis and estimating the project cost. 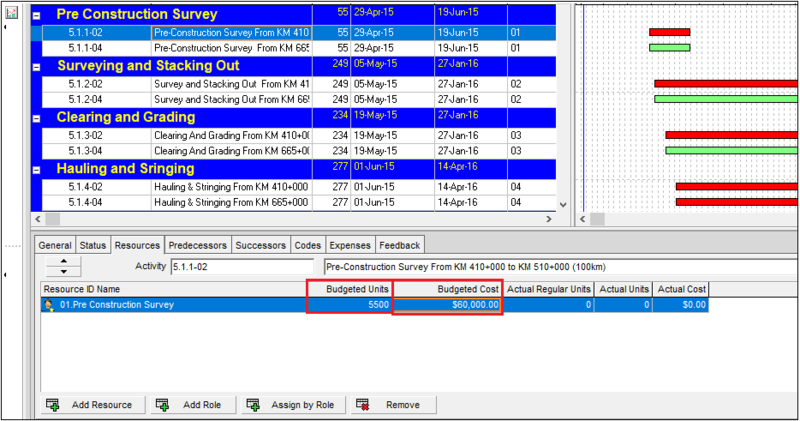 Primavera P6 not only shows the cost for each task but also shows the cost of each work break down structure deliverable, and the entire project. Resource management is very important for project managers. Note that resources are different than expenses because resources are time based and expenss are one time expenditures. Therefore when the resources are levelled, expenses are not included. In this article we take a glance at the resource allocation in primavera p6. If you want to add or anything, you can do by using the comments box below.